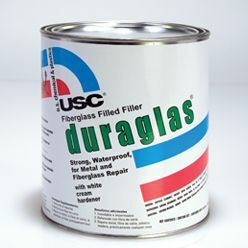 Short-strand fiberglass filler formulated with fibers to provide ultimate strength and durability on rust-outs, holes, tears and cracks. Rust and waterproof. For large repairs, use a fiberglass cloth. applications). Can be used on metal, aluminum, fiberglass, wood, masonry and concrete.